The renovation of the City Council chamber includes the addition of a up to date audio-visual system to compliment the meetings. The room is outfitted with a video projector and a large projection screen behind the chamber members. This projector displays a wide range video and computer graphic and a number of auxiliary video and computer inputs. 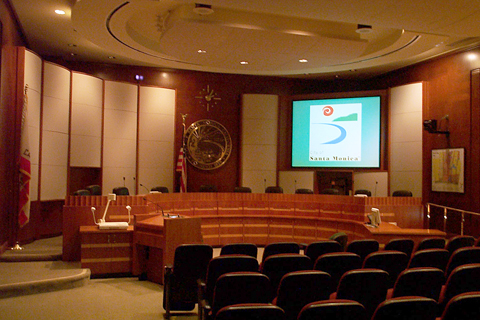 To allow council members to view material, a small monitor has been built into the dais at each council member position displaying the same image as the main projection screen. Distributed ceiling loudspeakers provide speech reinforcement and program audio playback and a dedicated dais mounted loudspeaker is provided at each council member seat.Â Individual microphones for each council member, staff members and the three podium locations are provided for the sound reinforcement system and also provides archival recording of the proceedings and outputs to the television broadcast system. Additionally, an ADA compliant hearing assistance system is provided. The system includes a remote control system to provide control of all system parameters from a single integrated control surface. Video and audio signals from the council chamber are also provided in the lobby.